BBC News - Will Europeans accept a generation of 'austerity'? Will Europeans accept a generation of 'austerity'? The years of steady enrichment in Europe seem to be at an end. Gone is the confident talk of prosperity through unity, instead the focus is on the great financial crisis welling up on the union's southern fringe, as a rising sea of debt threatens to drown the dreams of millions across the continent. When it gets dark the drug dealers come out in Exarchia Square. The students walk past them in little groups, deep in argument and abstract thought. Posters shout at you in vivid colours: against capitalism - against police brutality. The riot cops rest, exhausted, against the street corners. This is a typical scene from a place called Europe. 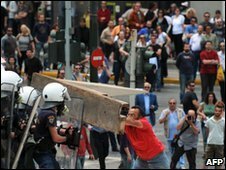 If you had to re-enact it, 1,000 years from now, you could reconstruct the whole thing from the costumes - the square sunglasses bourgeois women use to hold their hair back - the jeans and stubble of the manual working men who flood the streets of central Athens when there's a general strike. Layered, tribal, intensely urban, sporadically violent, intellectual, tolerant and until now resilient - this is the civilisation the European Union was set up in after 1945. 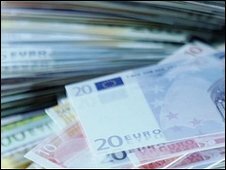 The euro currency was supposed to harmonise it all, but it now faces its biggest challenge for decades because Europe has become the weak link in the world economy. While China and America have recovered, Europe has been pushed through a door marked austerity. The eurozone has a currency and a central bank but no central government. In place of that, the 1992 Maastricht Treaty imposed common rules: low budget deficits, national debts below 60% of GDP, no bailouts and no central bank intervention in the market for government debt. At the time, all this seemed like a good idea. It was the prevailing economic doctrine. But if you live long enough, you do tend to see today's economic doctrine become wrapping paper for tomorrow's souvlaki. Fast forward to 2010. Europe has survived the credit crunch. The banks infected by that horrible American disease have been saved by medicine dispensed by the European Central Bank. So mild is Europe's recession that President Sarkozy and Chancellor Merkel have the moral high ground at G20 summits. The problem is that, just as with Wall Street, the rules were a fiction. The Greek government, with the help of Goldman Sachs, had moved some of its debts "off balance sheet", just like Enron and Lehman Brothers. As the truth emerged with the election of a new government, Greece's deficit doubled. Twice, Greece drew up plans to slash that deficit. Twice they were approved by Europe and twice the expected bailout failed to emerge. Then, those who lend money to southern Europe realised they might not get it all back. The markets had assumed the Greek people would bear all the pain of deficit reduction and now they realised they, the investors, would lose money. They looked at Ireland with its deserted villages of new-built homes, at Spain with its deflation and mass unemployment and made this calculation - if Greece is allowed to renege on part of its debts, then the rest will follow. So a crisis that could have cost 30bn euros to stop will now cost 750bn - a third of it from the IMF. The no bailout rule is dead. The "no IMF involvement rule" is dead and the European Central Bank, which once insisted on the highest quality collateral, is now swapping good, clean euro notes for, effectively, junk IOUs. Why did the EU turn a blind eye for so long to what was happening in Greece? Because all those Prada outlets in central Athens and all those shiny new tractors now lined up at roadblocks along all those brand new motorways in Greece were signs of "harmonisation". This was a phenomenon across south Europe. You could say the whole liberalisation process in politics - from Galway to Lisbon to Barcelona to Athens - was based on a middle class getting quietly rich on property speculation and tax evasion. The whole social truce constructed between the labour movements and employers was based on rapid growth in wages and pension rights, above all in the public sector. As the price of the bailout, the industrial giants of northern Europe want rigid rules on tax, spending and borrowing enforced. Northern Europe has seized control of southern Europe - and for me, this completes a process of risk-transfer that's been under way since Lehman collapsed. In the autumn of 2008 all the risk was in the banking system. Then, states all over the world took on that risk and for a year they contained it. Now the risk is passing from small states to big states. And it's passing to somewhere else - to the streets. Those narrow streets around Exarchia Square are world-notorious for radicalism and bohemianism. But you will find the same social mix in the 1,000-year-old streets of Oviedo to Perugia to Bratislava. A generation of adult workers who will now see their wages and pensions slashed. A young generation of college leavers who can see no future. For them austerity, even if it saves the euro, may never bring back the lifestyle they were promised. And the risk is they might reject austerity.